It’s early November, the wind is blowing piles of leaves across the ground, and it’s cool and clear – which makes it perfect graveyard weather. Maybe I’m weird, but I enjoy wandering around graveyards, particularly very old graveyards. In my hometown we had the Pioneer Cemetery and the Masonic Cemetery, both very old cemeteries. Wandering among the peaceful trees, reading dates, and wondering what their lives were like was a very enjoyable pastime. Finding someone who lived into their 90s in the early 20s? Fascinating. Someone who died at 19, and then realizing the death date means he probably died in World War I – it’s things like that. 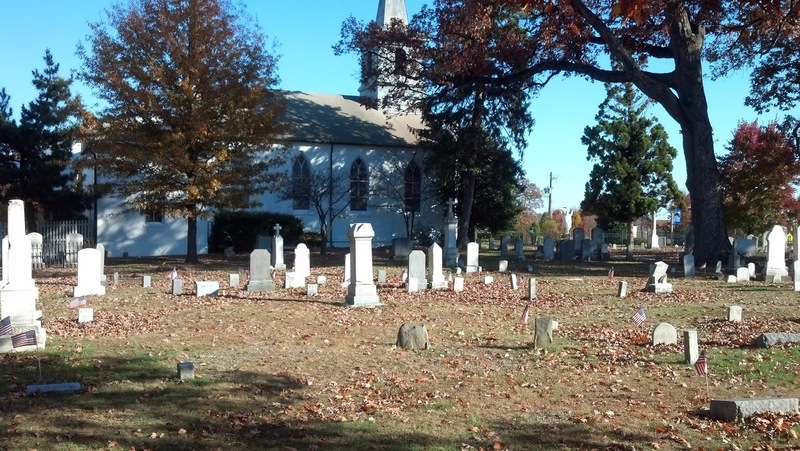 Now that I live on the east coast, there are even older cemeteries to investigate, and famous gravesites to visit. Especially living in the Baltimore/DC area. St. Mary’s Catholic Church, which holds F. Scott Fitzgerald‘s grave, is fifteen minutes from my house. So with nothing else to do today, the husband and I decided to go visit. The graveyard’s a little odd, in that Rockville Pike runs right beside it. So there’s a small patch of green, with huge oak trees and drifts of leaves, and on the other side of a small fence is a busy road and office buildings. The graveyard itself is beautiful, though. 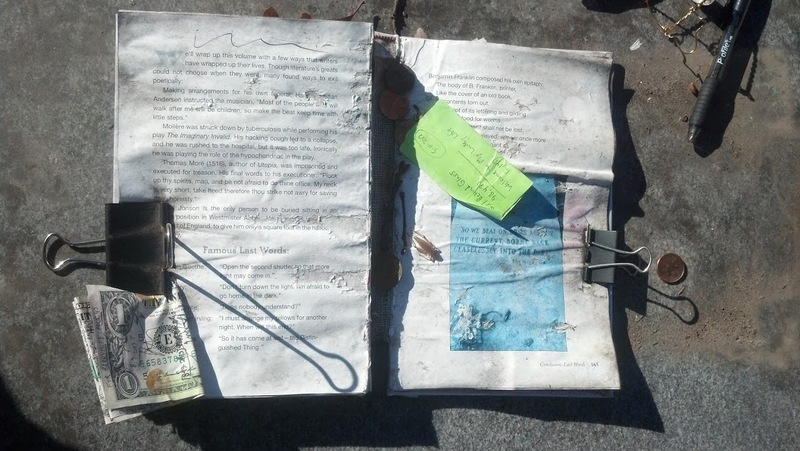 On the grave itself we found a few offerings; someone had left “Literary Miscellany” clipped open to the page about Fitzgerald’s grave. The gravestone has the last line of The Great Gatsby, Fitzgerald’s most famous work, inscribed on it. “So we beat on boats against the current, borne back ceaselessly into the past.” There were pens and pencils left beside the book, as well as dried roses and a wine bottle left near the headstone. I’m always curious about the stories behind the offerings – I suppose it’s pretty apt that a famous author’s grave inspires curiosity about more stories. 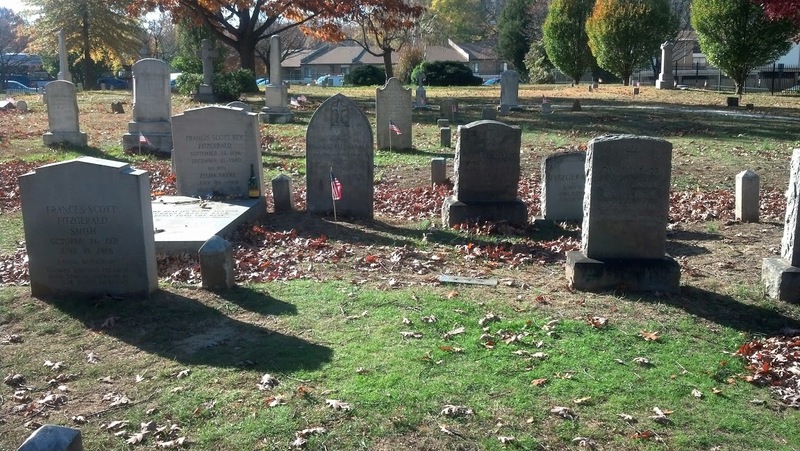 Fitzgerald is buried in a family plot; his wife, Zelda, is next to him, with children and other relatives close by. She was also an author, penning a semi-autobiographical novel called “Save me the Waltz,” published in 1932. Their marriage was not a happy one; at the time of F. Scott Fitzgerald’s death he hadn’t seen her in over a year, because she was in a mental hospital. 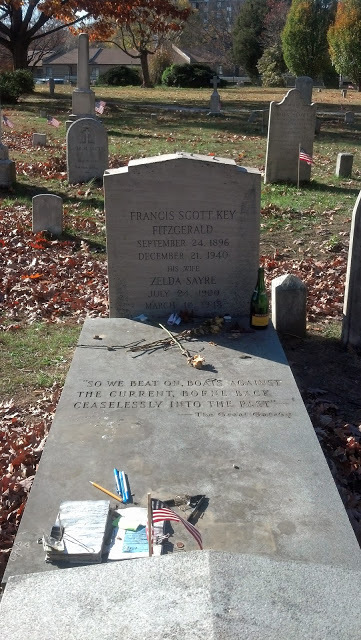 F. Scott Fitzgerald actually died in Hollywood and Zelda in North Carolina; he was originally buried in Rockville Union Cemetery due to the Archdiocese of Baltimore ruling him a non-practicing Catholic. They were relocated to St Mary’s and the family plot in 1975, after the family lobbied to have them posthumously “re-Catholicized.” It seems weird to me that you can be baptized or accepted into a religion after you’re dead, but I suppose the dead person isn’t going to care. I really enjoyed visiting Fitzgerald’s grave, and I intend to make “Literary Landmarks” a series here on Goddess In The Stacks. 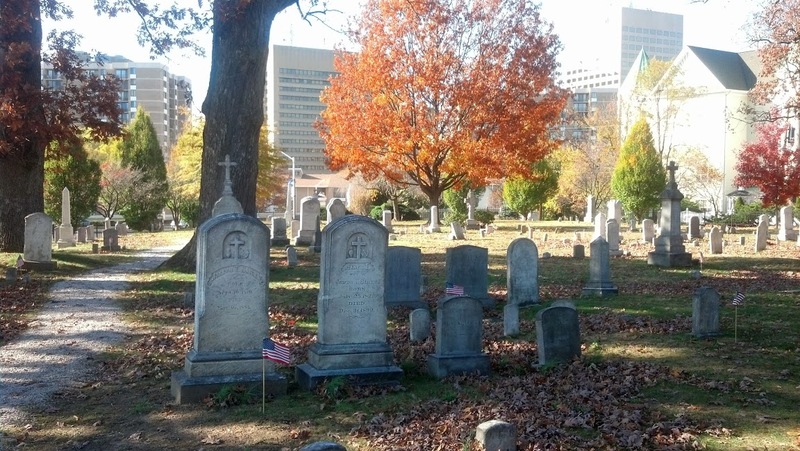 They won’t all be graves; there are a plethora of local sites with literary meaning, from The Library of Congress and The National Archives to the Poe House in Baltimore to Uncle Tom’s Cabin. I’m trying to find more local literary landmarks; I have photos from Edgar Allan Poe’s grave in Baltimore, and we’ve been on a tour of the Poe House in Baltimore, but I don’t have photos of that. It’s currently closed, set to re-open soon, so we’ll have to make a trip up there again once it re-opens! I’m still trying to find more local Literary Landmarks, so if you know of one in the larger DC metro area, please let me know!